Tymfi is an impressive mountain and its highest peak is "Gamila" (2.497m). 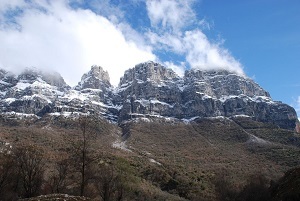 Other peaks are Lapatos (2.251 m.) and Astraka (2,436 m.). On the western slopes stands “Chasma Provatinas”(depth over 400 m.), which is one of the largest caves in the world. 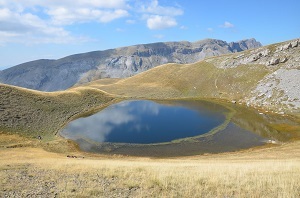 On the north side, above Aoos gorge there are impressive rocks and Drakolimni (Alpine lake). The local Sarakatsani (transhumant people) used to tell stories about a dragon living in this lake. The fight against his opponent, the dragon of Drakolimni of Smolikas created according to legend the treeless landscape of the area. Meadows are covered by herbaceous vegetation and are used as summer pastures by transhumant shepherds. The steep slopes are the habitat of the Balkan chamois deer (Rupicapra rupicapra balcanica) and golden eagle (Aquila chrysaetos). Numerous birds abound such as the white-winged snowfinch (Montinfrigilla nivalis), alpine accentor (Prunella collaris), horned lark (Eremophila alpestris), common rock thrush (Monticola saxatilis) and sufficient numbers of red-billed choughs (Pyrrhocorax pyrrhocorax), alpine choughs (Pyrrhocorax graculus) and rock partridges (Alectoris graeca).